Not sure whether you are following Pro-kabbadi these days (I am forced to see some as my son has become a compulsive fan !) – with less than a week to go for the Finale of the Star Sports Pro Kabaddi League, the competition is heating up. The stage is all set for high decibel action as the tournament now enters the 'do or die' stage. At this juncture, the Jaipur Pink Panthers have already qualified with 101 as Score difference – they have 53 points so far in 13 matches with 10 wins, 2 loss and 1 draw. There seems to be exciting contest between U Mumba, Patna Pirates, Telegu Titans, and Bengaluru Bulls and Dabang Delhi for the remaining places in Semis. 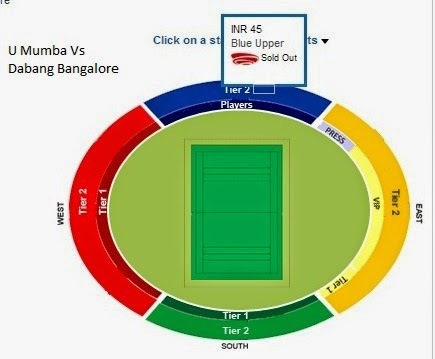 Can you guess the ticket price for tomorrow’s match at Bengaluru between U Mumba and Dabang Bangalore…. The top performers have been : Rahul Chaudhari (Telegu) 146; Anup Kumar (UMumba) 121; Maninder Singh (Jaipur) 107; Nitin Madane (Bengal) 101 and Surjeet Narwal (Dabang) 100. Elsewhere there is another Kabbadi tournament the “Wave World Kabaddi League” a professional Circle style Kabaddi League with participation from India, USA, Canada, Pakistan and the United Kingdom. The Indian team in the fray there is “Khalsa Warriors” - who registered their 3rd consecutive win by defeating Vancouver Lions by 67-45 in the 10th match – and for the games at Birmingham, a famous sportswomen wielded the mike ! Moving to UK and to Cricket - Gloucestershire is a county in South West England. Bristol is a city, unitary authority area and ceremonial county in South West England – where the 1st ODI between India and England is to be played tomorrow (i.e., on 25th Aug 14) The city received a Royal charter in 1155. It was part of Gloucestershire until 1373 when it became a county in its own right. The Schedule is : 2nd ODI at Cardiff on 27th; 3rd at Nottingham, 30th; 4th at Birmingham, Sept 2; 5th Leeds on 5th Sept – all at 15:00 IST. Cricinfo reports that England have lost 3 consecutive bilateral ODI series – losing to New Zealand, Australia and Sri Lanka…… and India has not won since 24 years – the last time being in 1990 when India won 2-0. India have played 3 Series since – however this statistics does not reckon the Natwest win in 2002 (Sehwag, Ganguly, Yuvraj, Kaif excelled in chasing 325) and Champions Trophy of 2013 as these involved more than 2 teams. The match is to be played at the County Cricket Ground (also known as Nevil Road) in Bristol; home ground of Gloucestershire County Cricket Club. Initially known as Ashley Down Ground, it was bought in 1889 by W. G. Grace and has been home to Gloucestershire ever since. It was sold to local confectionery firm J. S. Fry & Sons and renamed Fry's Ground. The club bought the ground back in 1933 and it reverted to its original name. It was sold again in 1976, this time to Royal & Sun Alliance who renamed the ground the Phoenix County Ground for eight years before changing to The Royal & Sun Alliance County Ground until the ground was again bought by the club and took it up its current title.